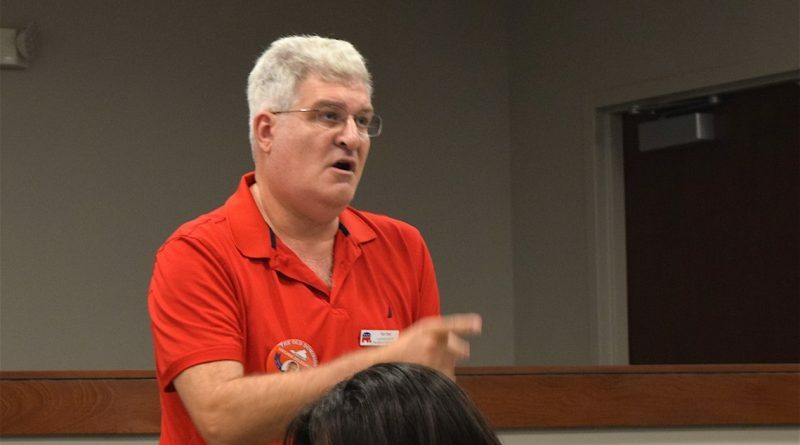 Former Leesburg District Supervisor Ken Reid addresses criticism of his 2012 vote to support the Phase II Silver Line extension during a July 25 Loudoun County Republican Committee meeting. The Loudoun County Republican Committee on Monday night heard pitches from four candidates seeking the party’s endorsement in November’s Town of Leesburg elections. One took some hits in return. The committee will vote Aug. 15 on whether to endorse Kevin Wright for mayor and incumbent Tom Dunn and challengers Ken Reid and John Hilton for Town Council seats. During Monday’s meeting each candidate was invited to address the committee, laying out their conservative credentials and pledging to make the next Town Council more decisive, frugal and business-friendly. It was Reid who came under fire. He did not seek reelection to the Leesburg District seat on the Board of Supervisors last year, but later decided return to the Town Council, where he served from 2006 to 2011. Reid, who was as alternate Virginia delegate to last week’s Republican National Convention, said he was looking forward to helping a strong GOP slate take control of the council. However, it was clear during the meeting that his endorsement vote will not be unanimous. Reid was criticized for casting the swing vote in 2012 approving Loudoun’s participation in Phase II of Metro’s Silver Line extension to Ashburn. Greg Stone was among the activists who warned that joining Metro would be fiscal folly for Loudoun and campaigned tirelessly against the project. He said Reid wasn’t just an early opponent of the rail project, but a key leader in the effort to block it. “Ken Reid was the tip of the spear for the anti-Metro movement,” Stone said. Stone and other members of the rail opposition group said that even days before the supervisors’ vote, Reid was leading meetings to organize the opposition. Reid said he changed his mind because of the emergence of a tax district plan intended to ensure that landowners closest to the rail line would pay the cost of its construction. He said that residents of his district showed support for the rail extension. He also claimed that if he didn’t vote for the project another, unnamed, Republican supervisor was prepared to cast the fifth vote needed to move the project forward. “The people of the county demanded it,” Reid said. Reid said that he had already “made peace” with another vocal Metro critic, Del. Dave LaRock (R-33), and hoped to do the same with Stone and other members of the opposition group. The explanation did little to quell the animosity, but former Sterling District Supervisor Eugene Delgaudio and Committee Chairman Will Estrada urged members to keep an eye on the bigger picture. Delgaudio, also an outspoken Silver Line critic, said Reid used “faulty reasoning” in deciding to support the rail line, but said that should not disqualify him from serving on the Town Council. “We want to take a bad situation and make it better,” he said, adding that Reid has worked hard to support Republican candidates and has been running a strong campaign. Ah, the local republican party – also known as the political party with no principles, since they will support candidates that are without principle who will say or do anything except tell the truth – is at it again, preparing to endorse Ken Reid, who, as is pointed out in this article, lied, and has costs this County hundreds of millions of dollars in debt, and an ever expanding black hole, with his Metro vote. What a party! Hey Mr. Lawgh… I could care less about the inner-party politics, but I’m curious; where did you come down on the Metro scam? Why, my very good friend Chris, I, if I had the chance, would have kept my word, would not have lied to my friends and I would have voted NO on the Silver Line extension into Loudoun County. As demonstrated in this article, Ken Reid lied to his supporters and friends, and is responsible for sinking us into a debt structure that will be a disaster for Loudoun County. Oh, and notice one other thing: See how Ken Reid tries to hang out to dry his past board members, by the pathetic claim that if he had voted no, someone else who voted no would have switched their vote to yes. Ken Reid is truly dishonorable. See Mr. Lawgh… You and I are in total agreement on the Metro debacle. Lawgh you have shown yourself to be a big Dem and along with that an over the top support of Umstattdt. Who was it that asked Town Council to send a letter to the BOS claiming their support for Metro? How did your girlfriend vote on that letter? If my memory serves me she and Dunn were the only two to vote NO on that deal. I will admit that I would have to look back at the webcast to confirm. I admit it, I am now confused, but laughing still the same. So, Ol’Loudoun, you say I am right in my criticism of Ken Reid for his dishonesty concerning his vote on the Silver Line Metro, because, then Mayor Umstattd agreed with me?